"Longer lifespans and the needs of the oldest old are challenging the senior living industry to find bold and compassionate solutions to combine programs and services with housing. Victor Regnier's latest research provides a thoughtful and insightful roadmap that arrays new ways of thinking from small-scale settings to community based options. International case studies offer possible solutions with the best thinking from around the globe...all with Vic's unique perspective of extracting themes and concepts that are broadly applicable and essential to addressing the needs of those that live on life's fragile edge." 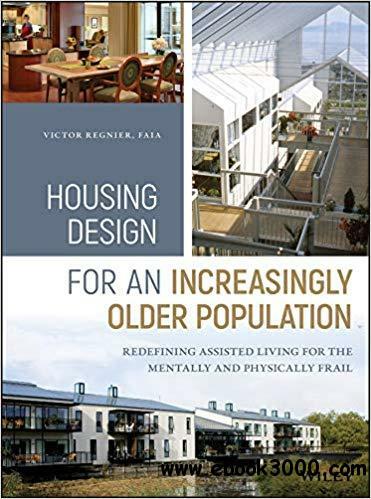 -David Hoglund, FAIA "Supporting the independence of the oldest-old is a tough problem Victor Regnier addresses in his latest book on aging and housing. Like previous work, Victor relies on the best practices of northern Europeans to outline a three-prong approach. First, providing extremely comprehensive home care services in an "apartment for life" setting. Second, reforming the conventional nursing home by exploring small group style accommodations. Third, combining new technology with community based services to age in place. Case studies document the experiences of others in making these programs work here and abroad. The magnitude of the 90+ and 100+ population increases in the next 50 years make it clear how important it is to address this concern today." -Edward Steinfeld Darch "The movement of health care from the institution to the home is a theme that Regnier identifies as one of the most important lessons in rethinking the issue of how to support the ever growing and increasingly aged older population here and abroad. He examines simple but profound approaches we can take in making long-term care a more humane proposition. Familiar themes like humanizing technology and optimizing the impact of the natural environment are brought together with clear policy thinking about what we need to do. The timing is good because the impact of this growing segment of society will have major repercussions on health care for the next 50-70 years." -Stephan Verderber, Ph.D. A comprehensive guide to designing housing for the world's aging population The dilemma of helping older people maintain their independence through better housing with services is growing. This book presents innovative solutions for those who create and provide housing for the world's increasingly longer-living population. By focusing on three specific housing and service arrangements, it offers alternatives that provide greater freedom of choice than the current living arrangements that exist today. It presents selected examples of housing and service solutions from the US, Sweden, Denmark and the Netherlands to stimulate thinking about the possibilities of community-based service models. Housing Design for an Increasingly Older Population looks at a trio of options for housing the "oldest-old: " the Dutch Apartment/Condo for Life Model (AFL); decentralized Small/Green Houses; and the provision of enhanced personal and health care for people who want to stay in their own home. It offers unique and eye-opening chapters covering: what older people want; what age changes affect independence; demographics and living arrangements; how long-term care is defined; concepts and objectives for housing the frail; care giving and management practices that avoid an institutional lifestyle; innovative case studies; programs that encourage staying at home with service assistance; therapeutic use of outdoor spaces; how technology will help people stay independent; and more. Based on the author's numerous conversations with other experts, as well as his examinations of high quality settings from Northern Europe and the US Building case study examples showcase innovative and compassionate solutions In-depth coverage of three major systems that work Examines successful programs such as PACE, Friendly Cities, NORC, and the "Village to Village Network" to demonstrate the progress made in helping older, frail people stay in their own homes for as long as possible Housing Design for an Increasingly Older Population: Redefining Assisted Living for the Mentally and Physically Frail is an important book for those who create, design, and manage assisted living and skilled nursing facilities, as well as for those who set policies regarding health, and personal care for our world's aging society.